Fan events are all about getting together with fellow LEGO enthusiasts to share ideas, brick building, and fun! 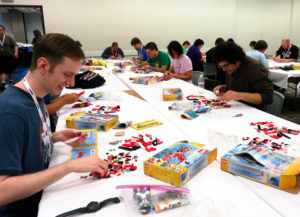 Although every LEGO fan event has unique aspects and activities, most west coast fan conventions in North America have a lot in common with a variety of games, presentations, brick badges, etc. 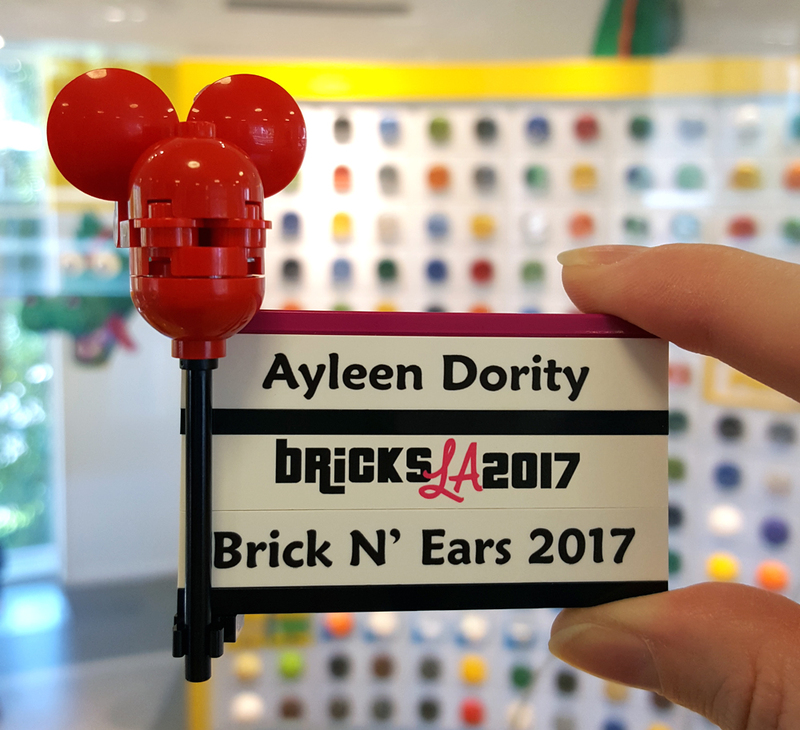 Below are some details of what an AFOL (Adult Fan Of LEGO) can expect if they register as a VIB (Very Important Builder) and are attending Bricks LA. Many conventions offer custom badge bricks included with registration. These are usually 1×8 bricks which are printed or engraved with custom text that you choose. They are often used as a name badge and could have your name, location, LUG (LEGO User Group), a funny saying, or anything you like on them. 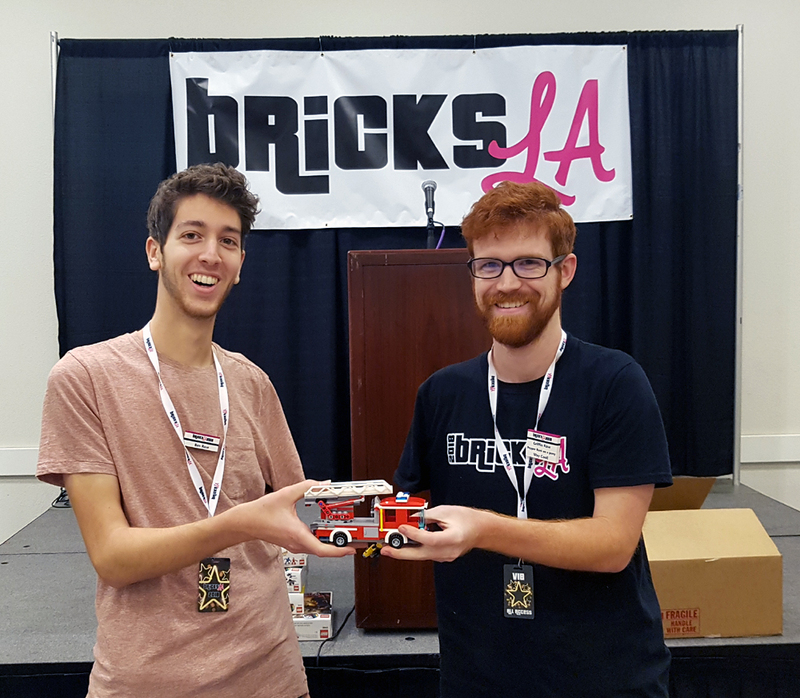 Bricks LA offers two custom printed bricks with each VIB registration along with a printed Bricks LA brick featuring the con logo and year. If you don’t already have one, we suggest one of them be your name! Some people also enjoy customizing their brick badges and building on them. Have fun with it! When you arrive, please check-in at registration to receive your goodie bag and most importantly, your VIB pass which gives you access to the whole convention throughout the weekend. 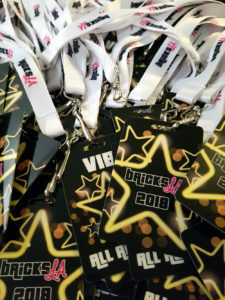 Be sure to wear your VIB pass for entry during public and non-public hours as well as entry to the VIB rooms upstairs which are exclusively for registered VIBs to use for games and activities. After checking in at registration, you’ll want to setup your MOC(s) (if you brought any) and meet your theme coordinator. 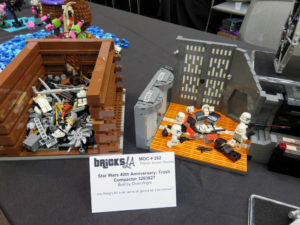 MOC stands for My Own Creation which refers to all of the awesome fan built models that AFOLs build and bring to display. MOCs can range in size from microscale (often as small as an 8×8 plate) to as big as you can transport (i.e. a seven foot Tower of Orthanc or 15’ Great Ball Contraption). You do not have to bring a MOC to register and attend Bricks LA as a VIB. If you have MOC to display, you can find your MOC card at registration. MOC cards are little folding cards that are displayed next to your MOC with info about the model, builder, and a number that people can use to vote for it (more on that below). Next, find the area for the theme you registered your MOC under (as noted on your MOC card). Each theme has a theme coordinator who is in charge of helping organize the MOCs in that area and helping with any questions you might have. This is also a good time to meet some of the other AFOLs displaying in your theme. Please remember to be respectful of other peoples MOCs. If a model that is not yours needs to be moved or adjusted, please find the builder or theme coordinator to assist you. Every event has slightly different themes and some have more than other. 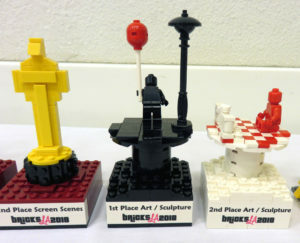 Bricks LA has some standards like Space, Art/Mosaic, Town, and Train as well as some more unique themes such as Screen Scenes and others that are sponsored by our local LUG (LEGO User Group), LUGOLA (LEGO User Group Of Los Angeles). You can check out MOCs from previous years at Bricks LA on Flickr and remember, the sky is the limit with what you can build! Bricks LA has two ceremonies throughout the weekend – 1) the opening ceremony on Friday to welcome everyone, answer questions, and give out some door prizes and 2) the closing ceremony on Sunday to give out trophies and more door prizes. At both ceremonies, door prizes are given away using a pick-a-prize system. Every VIB will have 10 tickets for each ceremony in their goodie bag. Please arrive to the ceremonies a few minutes early so that you can place your tickets in front of one or multiple prizes. We will then draw winners for each prize during the ceremony. It makes a lot more sense once you see how it works in person, but if you have questions, feel free to ask other VIBs or staff members. 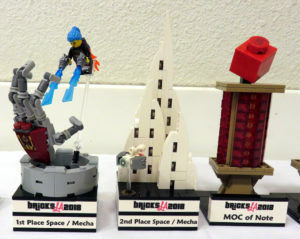 At the Sunday evening closing ceremony, trophies are awarded for outstanding MOCs in each theme as well as a few miscellaneous categories. These are chosen by theme coordinators and/or staff members. There are also two awards which are voted on – Best in Show and People’s Choice. Best in Show is voted on by VIBs and People’s Choice is voted on by the public. All of these awards are meant to be fun and perhaps inspire a little friendly competition or better yet, collaboration between builders. 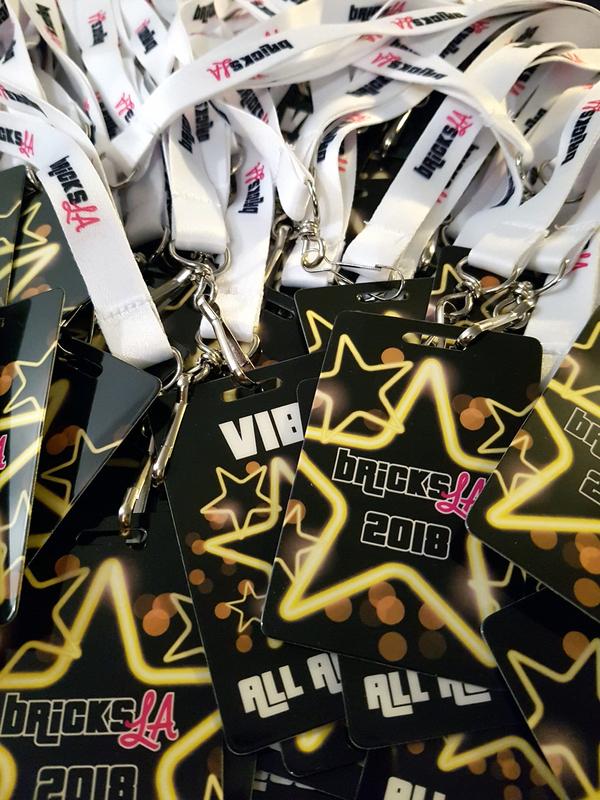 Every VIB is a winner to us – that’s why we call you Very Important Builders! 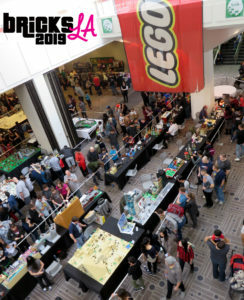 Bricks LA has public hours on both Saturday and Sunday where thousands of public visitors come to check out the amazing models, shop with vendors, attend panels, and enjoy the play area. We encourage builders to spend some time behind the MOC tables during public hours to help answer questions and inspire the next generation of builders. There is a good chance you’ll be asked the same question many times throughout the day, so please be polite – this is probably their first time experiencing the LEGO community and have never seen so many great models and awesome builders! We also ask that you please try to keep the area behind the MOC tables reasonably clean and tidy. There will be chairs and you are welcome to store things under the tables/tablecloths so that they are out of sight. Bricks LA offers a variety of games and activities throughout the weekend which are intended to be fun, social events. We encourage both participation and observation! Most games will be held in the VIB game room which is located upstairs in room 211. Please check the schedule for specific game and activity locations. Due to space limitations, some games will require signing up in advance. Other games and events will be able to accomodate a large number of participants and can be joined on site. Descriptions of each of the games and activities can be found on the schedule online as well as if they require advance sign-up. 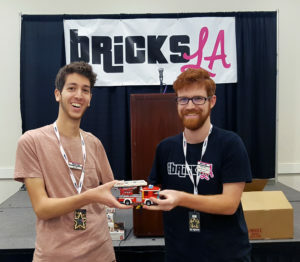 To participate in games that require advance sign-up, Bricks LA will send an email about a week before the convention with instructions on how to sign-up online. If more people sign up for a game then there are spots for, participants will be chosen at random from those that have signed up. Lists of game participants will be available at the registration desk for your reference. Our system isn’t perfect, but we try to make sure that everyone who wants to participate in games gets to take part. You can also show up at the beginning of a game and may be able to participate if some participants don’t show up. Bricks LA offers presentations for AFOLs on Friday as well as panels and discussions for both AFOLs and the public on Saturday and Sunday. Please check the schedule online and at the show for details on which presentations will be happening and when. If you have an idea or request for a presentation, please contact us! * When do we eat? The short answer is – that’s up to you! Although some snacks may be provided during evening social events, we try to build in a dinner break in the schedule each day and recommend taking time for lunch or a snack between other activities you may be interested in. There are lots of quick and sit down food options within walking distance of the convention center (Google Maps and Yelp can help direct you towards something you like). Remember that above all, we get together at fan conventions to have fun and make new friends! The Bricks LA team strives to provide a safe and inclusive environment for everyone, so if you have any questions or concerns, please contact us online or a staff member at the show. If you have registered to attend Bricks LA, we also encourage you to join the Bricks LA VIB group on Facebook where we provide info for AFOLs before the con, a place to help make travel arrangements, and generally have fun getting ready for Bricks LA!